If that mission is one you can get behind, please consider joining us! Be a part of a national grassroots effort by joining our network of volunteers striving to empower others and make the world a more accessible place. 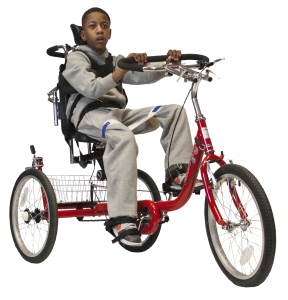 AMBUCS members are committed to providing Amtryke adaptive tricycles, awarding scholarships to therapists and performing valuable community service. Those service projects are often small but deeply meaningful projects that go unfunded by government or insurance — such as making homes and playgrounds accessible. Service to others is what AMBUCS is all about. AMBUCS provides fun, innovative service opportunities for people who want to help their community but do not necessarily have a lot of time to do so. 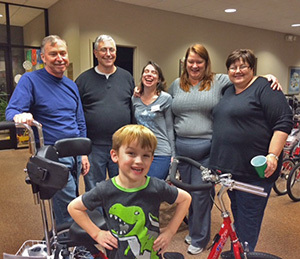 By working together, AMBUCS volunteers combine their individual strengths and maximize their spare time. As you work with other members, you’ll contribute to chapter activities and goals, and you’ll learn new skills that can pay lasting dividends in your personal and professional life. Plus, you’ll have the opportunity to make valuable contacts and develop leadership skills. With over 160 chapters in 36 states across the US, there may very well be one close to you. Visit our Chapter Directory to check and, if there is one in your community, to get contact info for reaching out. If there isn’t an AMBUCS chapter in your area yet, consider playing a role in bringing one to your community. Starting a chapter is easier than you may think. Visit here for more details.